Shopify – is the most feature-rich eCommerce platform out there. So let’s talk shop. While anyone with the proper website builder can put up a website, create a product gallery, add the ‘Buy now’ button and start selling products online, getting all the pieces of a full-featured online store may be harder than you think. The software can cover a great variety of eCommerce web design needs. By using the system, you can set up your online store and give it the desired look and performance. You’ll be able to sell both physical and digital products, create, organize and update product gallery, accept payments and orders etc. 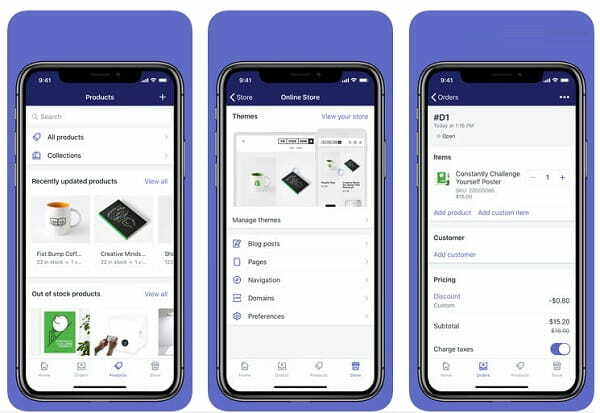 Being a fully-integrated eCommerce solution, Shopify works great both for newbies and proficient designers – this is one of its major advantages. As of the end of 2018, the company’s turnover constituted $29 billions. Shopify clients are Tesla Motors, Wikipedia, Mozilla and Google. After the shutdown of Amazon Webstore in 2015, the online trade giant Amazon has recommended their clients to use Shopify for their selling needs. An opportunity to make sales via Facebook appeared a bit later. The consecutive step implied PayPal partnership, which resulted in the growth of popularity and sales volume of Shopify website builder. Hopefully, you have understood the scale of popularity of this platform. We are impressed with it as well, but this will not affect our objectivity when testing the platform. Let’s find out together what exactly Shopify can offer us and how interesting for users it can be. Provides a rich set of eCommerce features. What I like most about Shopify is that you simply can’t get lost there. Once you have registered (there are only three fields to fill out: store name, email address and password), their wizard will guide you through all the stages of website creation. 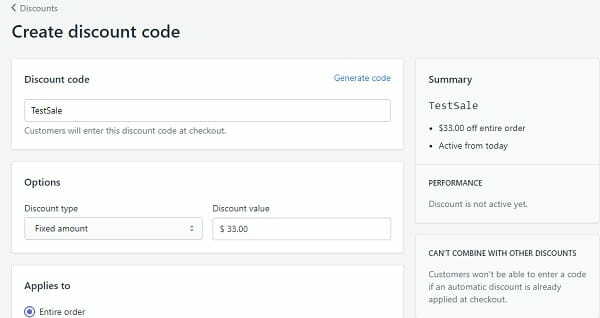 Once you’ve configured the main settings of your store, you can fine-tune its look using Shopify Storefront Editor (by going to the themes page in your Shopify admin panel). 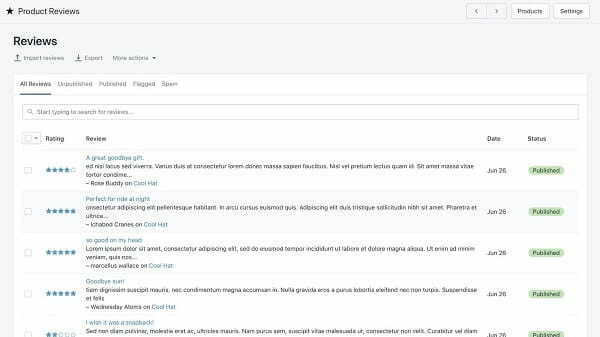 The editor makes it easy to make changes to your store’s design by splitting your screen into two areas: a live preview and a control panel where you’ll make design choices. Shopify users can manage their shops from their phones and even their watches – thanks to the family of free Shopify applications for iOS and Android. Some key features of the mobile apps include: order notification, easy fulfillment (you can send shipping notifications to your clients right from the post office), inventory management (you can take product photos, delete old items, change prices and more). All changes are automatically synced with your online store and Shopify POS. Exceptional simplicity and convenience for each and every user. Shopify apps for Android and iOS. Functionality is something that Shopify really excels at. The eCommerce software comes with an extensive feature set, which covers all the shopping and marketing needs of users. Let’s see the detailed overview of features that make Shopify stand out from the crowd. 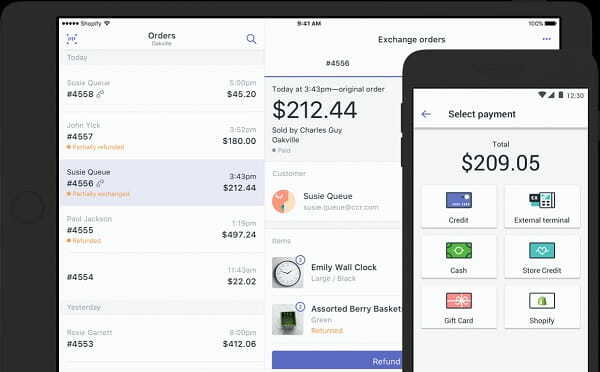 When using Shopify, you can effectively synchronize your account with third-party apps like Xero or Quickbooks, for example, and accounting software. By syncing your Shopify account with Quickbooks, for instance, you can seamlessly file your product, payment, tax, and customer data into correct accounts and ledgers. Merchants can also take advantage of powerful accounting functionality to view account balances, create receipts, and even run detailed reports to analyze customer trends, track top-performing products and more. Shopify comes with a powerful blogging engine, which makes it possible to create lookbooks, publish and categorize articles as well as initiate discussions between users. There is also the Future Publishing feature, which allows scheduling the posts you write for your blog to get them published when you are away. With Live View, you can now track your web store performance in the real-time mode. By using the tool, you can control the number of visitors and locations they come from, watch the conversion rates, sales volume, monitor daily amount of visits, sales and orders, see the number of pages customers view etc. Being a powerful eCommerce software, Shopify offers an opportunity to add, create and manage multiple product lists. 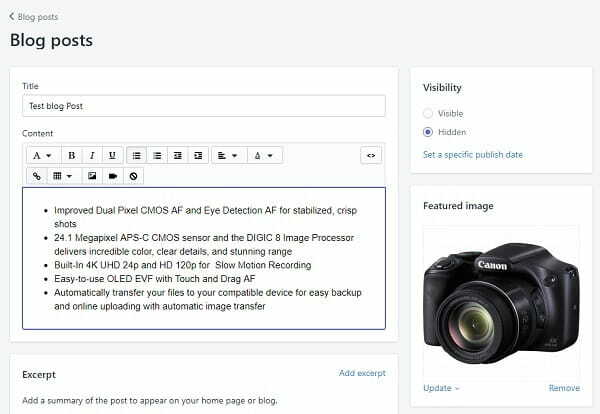 What you can do here is to add detailed products reviews, make use of the CSV file product import/export features, create appealing show windows with photos, product variations and their descriptions etc. The multichannel feature deserves special attention. If you’re a busy merchant, who sells across different platforms, then you have the first hand knowledge of how complicated and time-taking synchronization of customer databases, inventory and finances can be. Shopify helps you make these processes automated to avoid the unneeded manual work by introducing multichannel support. It’s not easy for a web store owner to track all the orders on time as there may be dozens or even hundreds of them every day. At the same time, it’s crucial to ensure the best services to retain customer attention. This is where the Abandoned Checkout Recovery feature is of great help. It sends automatic emails encouraging customers to complete their purchases, if they have left some products in the shopping cart without placing and order. All Shopify credit card and transaction information is protected by the same level of security used by banks: a 256-bit SSL certificate. This also ensures maximum confidentiality of your personal and financial information to prevent unauthorized access of third-party users. The Fraud Protect Feature is available for US merchants. This is the automatic way to protect customers’ orders from fraudulent actions so that you could focus on their effective completion. Fraud Protect implies a small extra charge for all the secured orders. If a fraud happens, a customer will automatically get a chargeback. This is a great way to additionally secure your purchases. Shopcodes (QR codes) are available in the Shopify App Market to simplify the process of mobile shopping. The Shopcodes direct customers to the required product pages or to the checkout procedure to simplify the process. Each code is unique and you can use it to purchase a certain product from the Shopify web store. Shopify keeps expanding its boundaries, with new languages being integrated into the platform. The eCommerce software now makes it possible to create several language versions of your eCommerce website to ensure the exceptional and convenient shopping experience. The advanced Augmented Reality feature makes shopping much more entertaining for small businesses. It has revolutionized the entire mobile shopping experience by providing 3D images of products customers can further size up, place in the surrounding environment and examine in details from all the sides. Shopify does not only allow creating and managing small-to-large web stores, but it also lets you make sales at your retails storefront. This feature is known as Point of Sale software. It can be applied to use the available external card terminal, accept orders in the offline mode (they will synchronize with your Shopify account by default), create and manage several secure staff accounts etc. This feature allows users to sort out their customers by different parameters to effectively manage their web stores. Thus, you can segment customer profiles by purchase activity, account status, location, and more to create effective promo campaigns. For instance, you can send a special coupon to customers who have spent over $100 in your store. Shopify is a full-featured eCommerce software, which is ideally optimized for mobile commerce. It is now possible to update and manage your Shopify-based web store from any mobile device you have at your disposal. This is very convenient for entrepreneurs, who have got used to working on the go. With Shopify Ping – a new mobile app – you can run your business from any place you are in by enabling customer conversations, marketing workflows and other options. This is also your integrated assistant, who can help you effectively plan, create and manage your marketing activities. The updated Shopify App Store lets you discover versatile apps to effectively grow your business. This is the place, where you can come across and integrate multiple free and paid applications to help you get started with your web store, increase the amount of sales and reach other eCommerce and marketing goals. With Shopify App Store, you can choose between thousands of high quality apps for your online store. Search filter option and smart app recommendations simplify the choice of the best apps tailored specifically for your business. You can create Buy One, Get One (BOGO) discounts with Shopify to encourage customers to buy from you. Having created a discount, you’ll be able to share the link to promote the offer and direct visitors to the required page. A nice solution is to offer your newly created BOGO discounts to special customers to boost the retention rate and hold effective loyalty programs. BOGO feature is accessible on mobile and desktop devices. This is a one-step checkout procedure, which makes it possible to personalize the shopping experience of customers, ensuring smooth checkout process and offering them to make a payment directly on the home page. This simplifies the shopping process and makes it much more convenient than before. This is a brand new Shopify marketing feature, which allows customers making contactless “tap” payments via Apple Pay and Google Play apps. The system also makes it possible to use unique chip-enabled credit cards to ensure advanced security payments and build strong connections with customers. Integrated PCI and EMV chip technology ensures safe payment transactions. The new Tap & Chip Reader has synchronization with Shopify POS to let you make and receive payments and manage inventory and products all in one place. With Shopify, you can now manage inventory across multiple locations, accept online exchanges and returns from Shopify POS. It is also possible to enable tipping option, which lets customers offer tangible and immediate feedbacks on their visits. To make the checkout process simpler and more customer-oriented, you can use another Shopify POS app – Customer View – that lets retailers launch a secondary mobile device, which will face customers during the checkout process to provide them with a more distinct product view, price ranges, receipts and tipping options. As a result, users will benefit from a more transparent checkout process that lets you prevent the mistakes and puts customers in charge of the shopping process. Google Account users have got an opportunity to make Shopify payments by accessing their payment and shipping information stored in their accounts. This is needed to speed up the checkout process and let users complete their purchases in a few clicks only. This also helps reduce the percentage of abandoned shopping carts and boost conversion rates. Shopify has recently launched a set of Marketing Activity and Sales Attribution Reports. They provide a deep understanding of your marketing strategy efficacy and identify the points that require improvement. With new Marketing Analytics tools, you can run multiple marketing campaigns, using a variety of tools, such as Facebook, Google, MailChimp, Kit etc. By using the feature, you will be able to find out your best selling products, most active customers, average order value, sales and order statistics, customer behaviour, conversion details, attribution model comparison, conversions by first and last interactions etc. With the advanced UPS Shopify Shipping feature, you will be able to make use of competitive shipping rates, guaranteed delivery date parameters, exclusive discounted offers (which is especially important for bulky goods), holiday shipping bonuses, assistance with your shipping strategy development and other privileges. Launching a web store is a crucial process, but it’s not the only must-have step to make your eCommerce website successful and profitable. Effective promotion is what you should take care of right after the website is ready to be available on the web. This is where you won’t go without an advanced SEO strategy. abundance of marketing applications, which can help you attract, return and work with potential and regular clients. When it comes to SEO, Shopify doesn’t have any problems at all. Being popular across the globe, this eCommerce software ensures decent promotion of each web store developed with it. You just need to be aware of the major SEO nuances to effectively use multiple system options. If you manage to do that, then you’ll certainly succeed in your aspirations – just like anywhere else. Shopify lets you track your web store analytics in a variety of ways. A convenient and actionable dashboard of the system provides the data regarding your sales, traffic and orders to help you notice the potential problems and undertake special measures on time. You can also analyze and get the insight into the development of your web store by looking through product reports. They will help you find out the products that are selling well and those that are not. If you have such a need, you can export the reports in spreadsheets of your choice to be able to view the data and make further analysis. These reports can likewise be sent to your accountant or any other person responsible for web store performance analysis. Shopify allows integrating Google Analytics into your online store. The tool helps track sales, traffic data, orders, visits, referrals and other crucial aspects. Based on this data, you can create traffic and referral reports to see where you customers come from and how they manage to find your website. The eCommerce software comes with the mobile app that lets you make the major actions to control your web store performance even on the go. What you can do here is tracking order fulfillment, accepting payments and sending shipping notifications from the post office. Convenient and intuitive mobile dashboard lets you see the aspects that require your precise attention as well as follow the latest industry trends. You will also get access to customer profiles and send email notifications to them. Apart from that, you will be able to reach multiple inventory tools that let you add/manage products, take photos of your products, change prices at the website etc. What matters most is that all your orders, billing history, inventory tools, products and customers will synchronize between your web store and Shopify mobile app in the automated mode. These are only a few benefits you will avail, when downloading and installing the application on your mobile device. Right after the registration, you will be redirected to the control panel without the need to select a template like in most traditional website builders. The Debut theme is chosen by default here. This is the basic template, which does not contain any demo content. This is the design with a classic set of blocks used for online store creation. It is easy to customize it, which allows getting decent material to work with in a future web store. You can certainly change the start template to any other theme of your choice. You just need to get to the «Online Store – Themes – Visit theme store» section. All the templates fall into collections (or categories) and it’s possible to filter them by novelty, popularity, free or paid nature etc. Unfortunately, there are only 10 free templates here, but their quality is on a decent level. Generally, it is possible to find the one, which will come up to your needs after customization. Just make the choice based on the required structure and don’t mind the demo-content. It’s easy to replace it. The number of paid templates currently constitutes 45. The cost ranges from $100 and up to $180. Generally, they are much more interesting as compared to free themes due to their versatility and rich choice of used design tools. However, there is no big difference between paid and free templates. Paid themes are more creative, but it’s easy to compensate the difference by improving a free sample. Each template comes with description, 2-3 design styles and a real-time preview option, website samples created with it as well as user reviews. Generally, the choice of Shopify templates is a pleasant process. Everything is consistent here and it’s difficult to make the wrong choice. You can set several templates at a time, having chosen one of them as a primary theme. It’s possible to switch to the required template any time you need that. There is also an opportunity to upload your own themes. Each of them has flexible settings. You can change the block order a template consists of and make general settings, including colors, typography, social bar position and favicon. Each section also has its settings – choose the image, text, align them as needed, enable/disable buttons, menu, set up the sizes of separate elements etc. See also: Real Shopify website examples. The conclusion is as follows: paid system templates are quite expensive, but there are also nice free designs. The quality of both template types is on a decent medium/high level. Customization options are above the average, while the settings interface is also convenient. The general mark is 9 out of 10. Quality free and paid templates. Powerful and versatile design customization features. Shopify customer support is definitely worth the subscription cost. Provided 24/7, it will effectively help you find answers to all the questions you will encounter during the web store creation and management process. Shopify Help Center won’t leave you face-to-face with your problems. There’s a huge forum with thousands of topics (including a separate forum for off-topic discussions), how-to guides, email support and Live Chat with a Shopify Guru. But the most useful (as for me) is Shopify forum. It’s a place where you can find not only answers on technical issues, but there are lots of real Shopify users feedback, both positive and negative. The dedicated support team is always here when you need them. You can interact with Shopify experts, including developers, eCommerce designers, marketers and other specialists, whose help is currently a priority to you. Finally, the software grants an opportunity to visit the eCommerce University to improve your online marketing and business knowledge. This is the place, where you can find lots of eBooks, webinars, video series and other useful online sources. This feature-laden site builder is going to be consistently more expensive month to month than a self-hosted store. The cheapest Shopify plan is $9/month. This plan is called Shopify Lite and lets you add eCommerce to any website you already own. This plan includes unlimited products, 70+ payment gateways accepted, global tax and currency support and sales tracking, among other features. Lite: $9/mo ✓ ‘Buy’ Button Option. Other plans include Basic ($29/mo), Shopify ($79/mo) and Advanced ($299/mo). The plans are differentiated based on the storage, gift cards availability, abandoned cart recovery and some other features. It’s noteworthy that Shopify is transaction fee-free, yet it charges credit card transactions (Online: 2.6-2.9% + 30¢; In-person: 2.2-2.7% + 0¢) if you use Shopify Payments to accept credit cards through your store. You can try Shopify for 14 days for free. All in all, you can try almost all Shopify features due to the trial period which is 14 days long. But after that you have to select one of the subscription plans. Some users may think that absence of the free plan is a drawback but those who wish to promote their business online must know that it’s impossible to make it for free with quality. Broad range of eCommerce features included into subscriptions. Shopify is a powerful and feature-rich eCommerce website builder. Just like any other system, it has its strong and weak points that may have positive or negative influence upon your eCommerce experience. ✔ Clean, easy-to-use interface with intuitive navigation that works well for users with diverse web building experience. 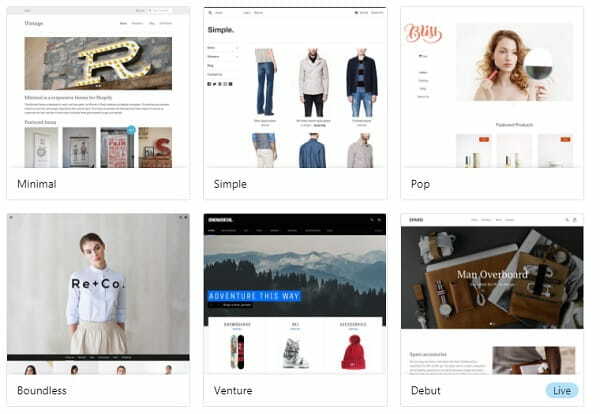 ✔ Collection of high quality responsive templates to match different eCommerce niches. ✔ Availability of free Shopify applications for iOS and Android. ✔ Advanced Shopify POS software. ✔ Integration with Amazon Marketplace. ✔ Powerful built-in blogging platform. ✔ Multilanguage and multichannel support. ✔ Augmented reality support. ✘ Expensive pricing plans. ✘ Credit card transaction fees. ✘ The system is not so easy-to-use for newbies. ✘ Reporting feature is available on advanced plans only. Advanced synchronization and integration options. Frankly speaking, the ‘pure’ Shopify competitors here are BigCommerce and Volusion – as these website builders are focused to eCommerce. Of course, you can create an e-store with Wix, Weebly or Squarespace, but Shopify has much more commerce solutions. Switching from Wix to Shopify – a detailed instruction how to transfer your store from Wix to Shopify. Switching from Squarespace to Shopify – a complete manual on moving you eCommerce from Squarespace to Shopify. Question: How easy is it to set up Shopify shop? Answer: Setting up a web store with Shopify is easy and quick. What you need is to sign up with the system, choose a plan (the system offers a free 14-day trial), select and customize a template that matches your eCommerce needs and start adding products. The system will offer step-by-step recommendations and powerful customer support to help you get started. Question: How much does Shopify cost per month? Answer: Shopify has a free 14-day trial and four paid plans, which differ in the range of features provided. These are Lite, Basic Shopify, Shopify and Advanced Shopify. The monthly cost constitutes $9, $29, $79 and $299 correspondingly. Answer: Yes, Shopify ensures maximum safety protection by offering the enhanced 256-bit SSL certification. It effectively protects your web store and personal information from unauthorized third-party access. Question: Are Shopify payments secure? Answer: You shouldn’t worry about your Shopify payments safety as the system ensures ultimate protection of your credit card and transaction data. SSL certification is a surefire way to protect your payments from any types of online frauds. Question: Can you sell a service on Shopify? Answer: Shopify allows selling physical and digital products as well as services. Whether you are a web designer, a copywriter, a fitness coach etc., you can display and sell your services in a professional online store launched with Shopify to boost its reputation, grow customer base and make profit. Well, after the in-depth Shopify review I can conclude that it’s is the super feature-laden eCommerce software that offers a smorgasbord of amazing eCommerce (mCommerce)-specific options allowing you to create a gem of a web store. The system is full-packed with features, tools and options that can bring your online store functionality to the brand new level, helping you attract customers, boost your sales volume and reach multiple eCommerce goals. Whether you plan to build a small or a mid web store for local use or a huge international hypermarket selling thousands of products, Shopify will cope with the task in the best way possible. Its advanced eCommerce, marketing and SEO features deserve special attention of users, who plan to get the most out of their businesses. Promotion of Shopify-based web stores is not a problem at all. So, if you lack SEO and web design skills, you shouldn’t worry about that. The thing is that Shopify comes with a powerful SEO engine, which makes it possible to automatically fill out the meta tags and adjust the required SEO parameters to ensure effective promotion of your newly created eCommerce website. Shopify rightfully deserves the title of the best specialized eCommerce software. Web stores created with it are functional and logically-structured. They feature intuitive navigation that results in high customer engagement and retention rates. If you have long-term eCommerce objectives, then Shopify is definitely worth trying! I highly recommend you check this website builder yourself to see whether or not it’s the best fit for your project.